“I don’t think I’m going to like it at all. I think it’s going to hurt. 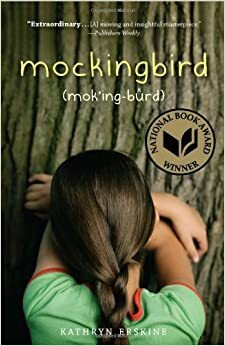 But after the hurt I think maybe something good and strong and beautiful will come out of it.” The book Mockingbird, written by Kathryn Erskine, tells the inspirational story of Caitlin Smith who loses her beloved brother, Devon, in a shooting at his school. For Caitlin everything seemed to be a struggle because her Asperger’s syndrome. As a result of the syndrome, Caitlin has a hard time reading people’s emotions and understanding them. With the help of the school’s guidance counselor, Caitlin´s friend Michael, and her Dad, Caitlin learns how to feel empathy and sympathy towards people and how to finally understand the death of her brother. On her way to “find closure,” or in other words to compass her loss, Caitlin has to help her dad and Michael get over their losses as well. Michael’s mother was also one of the victims in the shooting, therefore Caitlin and Michael help each other with this shared connection. Before the shooting,Caitlin’s Dad had a very tough time recovering from the death of his wife as well as Caitlins mother due to cancer and the death of his son, and caused even more grief in his life. Caitlin realizes this and at first she has a hard time reading his emotions and understanding his grievances but soon she finds a way to rejuvenate him and Michael. I love that the author, Kathryn Erskine, explained the story from Caitlin’s point of view because it helped me understand Caitlin’s thoughts and feelings throughout the book. I would recommend this uplifting story to anyone who has read and enjoyed “Wonder” by Raquel J. Palacio or “Out of my Mind” by Sharon Draper. I thought the fact that the book was inspired by the 2007 campus shootings of 33 people at Virginia Tech University in Blacksburg was devastating but it made the story more interesting and helped me to visualize the setting. Although Mockingbird had many sober and emotional parts, it was a truly heartwarming story and I will forever remember Caitlin’s journey forever.